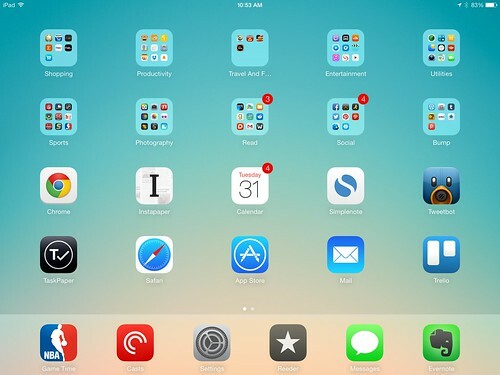 What my iPad Home Springboard Looks like on the last day of 2014, a photo by bump on Flickr. I’ve had one iPad from every release generation so far. I ordered the original iPad from the hospital on the day my first son was born. In many ways, and most of them that count, my iPad is my primary computer at this point. It travels with me, attends every meeting I attend, and is my constant companion at home. I read my news feeds on it using the newest generation of Reeder. I answer most of the email that I actually answer on it. It’s a work tool, and a personal tool, and, as a result, the yearly release of the new iPads is an assumption of upgrade. For the last year, I have had two iPads that have seen some amount of use. An iPad 3, only 18 months or so old at this point, and the iPad Mini, which was purchased/provided by my employer. As the year went on, I used the iPad 3 less and less. I love the iPad Mini’s weight, despite the obvious tradeoffs that came with, these are well covered on the web already, and old news, I won’t cover them here. When this year’s iPads were released, it seemed like a slam dunk that I would wait for the Retina iPad Mini, and that would be the penultimate iPad for me. Oddly, that’s not the way that I went. I purchased a 64Gb Verizon iPad Air, and I couldn’t be happier with it. It weighs about what the Mini weighed, and it’s just so much better for typing. As I have started using the device more and more as my personal computer, the size of the on screen keyboards touch targets has become important to me, I have meaty brawler hands. I’m sure that I could have been happy with the Mini as well.